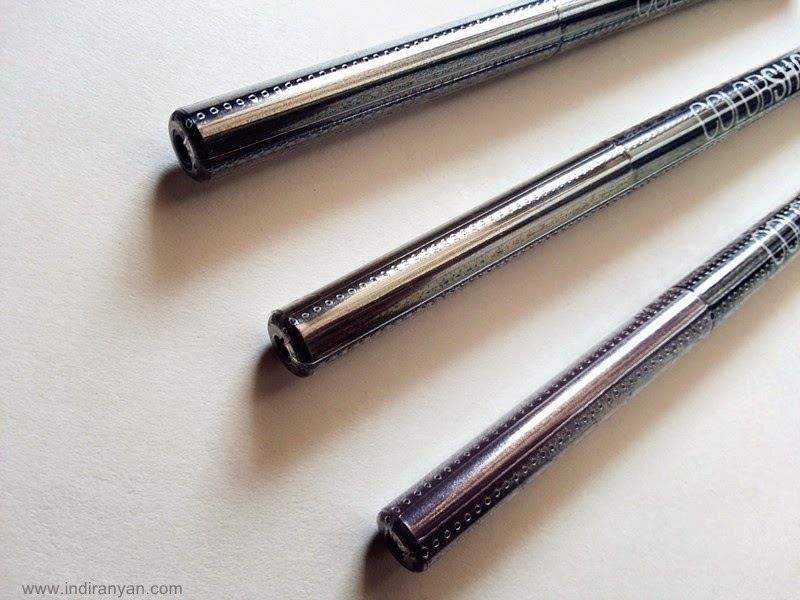 I have review of eyeliner from so well-known drugstore brand, it is Maybelline. 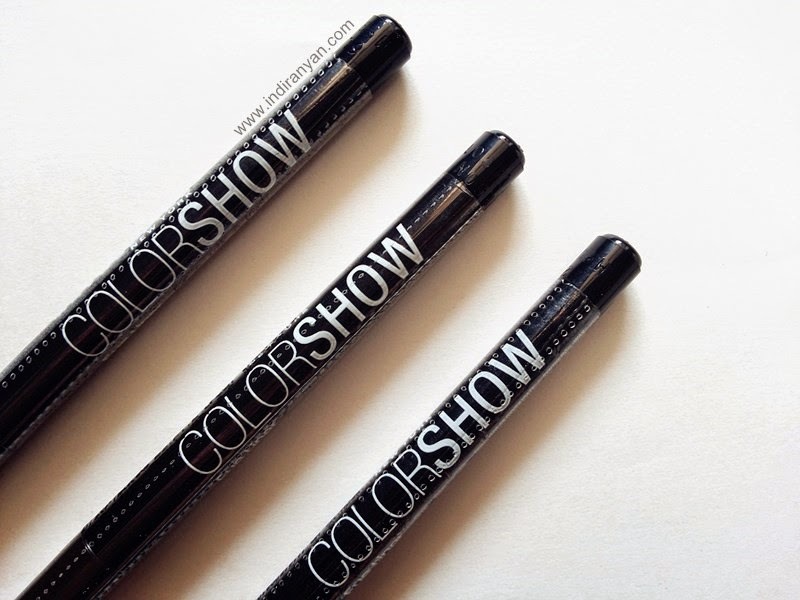 This eyeliner is from Color Show series, I already reviewed 4 lipstick of Color Show series (read here), post about it is a hit for my blog. 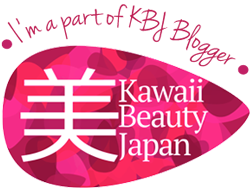 Almost every day visitor come to my blog to read review of that very affordable lipstick. Now let's talk about the eyeliner! 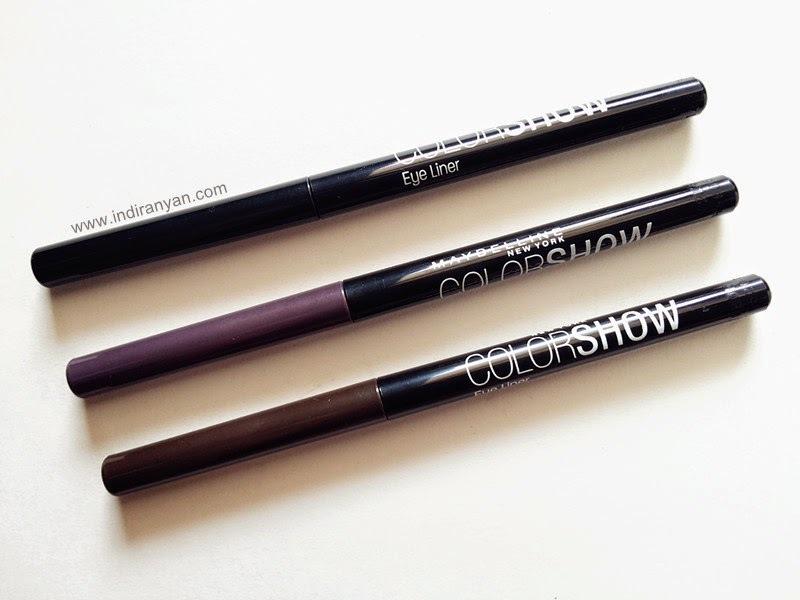 Price of Maybelline Color Show eyeliner is only 30.000 IDR (less than 3 USD), the price is same like the lipstick and nail polish too and we can still get them in more cheaper price also sometimes they have promo buy 1 get 1. 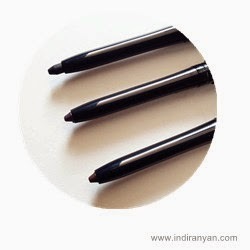 In Indonessia this eyeliner is available in 7 shade, which is : Deep Black, Cacao Brown, Spicy Orange, Ocean Blue, Peacock Green, Inca Gold, and Noble Purple. I have 3 shade: Deep Black, Noble Purple, and Cacao Brown. The packaging is simple, slim and easy to bring . First time when you buy it, it still sealed, on that plastic seal there is written information of the product. After break the seal only Maybeline New York Color Show Eye Liner words left. The cap color is same with what color of the eyeliner inside. This eyeliner is a twist up crayon type, with sharp point. The point is not really sharp after several time usage, but the point is still small enough so I don't need a sharpener. 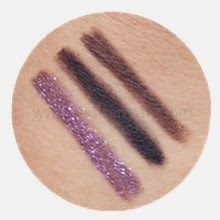 The Deep Black and Cacao Brown is matte, and the Noble Purple contain glitter. 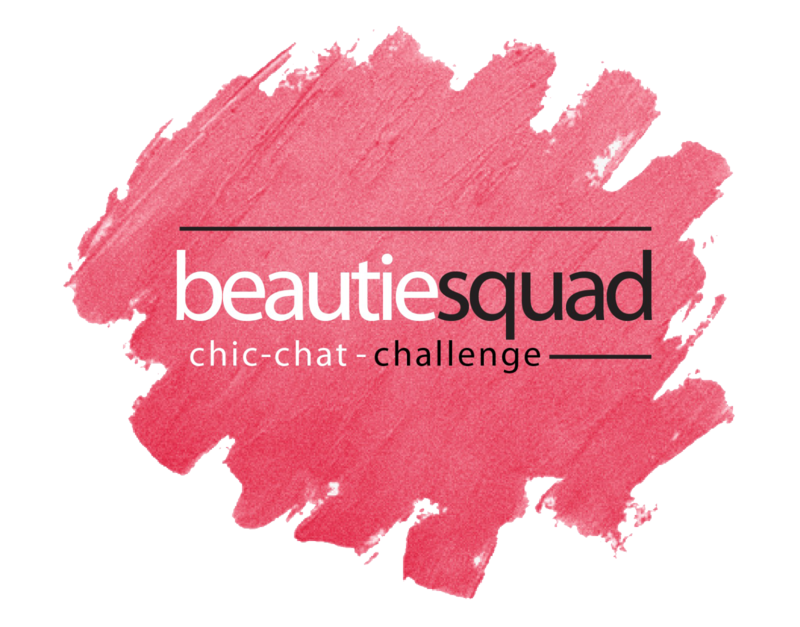 The texture is creamy, but it not glide up easily on my eyelid. When I do the swatch all color is easily show up on back of my hand. But it's different story when I tried to apply it on my eyelid, the Noble Purple color is kinda hard to show up, just some glitter show up. Although it stated as eyeliner, also I can use this for my eyebrow. Mostly I use the Cacao Brown shade for my eyebrow and the shade Deep Black for eyeliner on daily makeup. 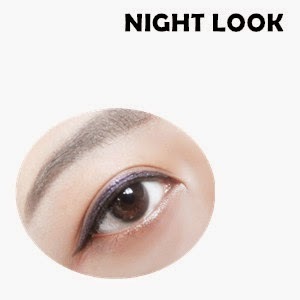 When I want a bit glamour look or in lazy mood to apply eyeshadow I use Noble Purple shade on top of the Deep Black shade and add faux eyelashes. 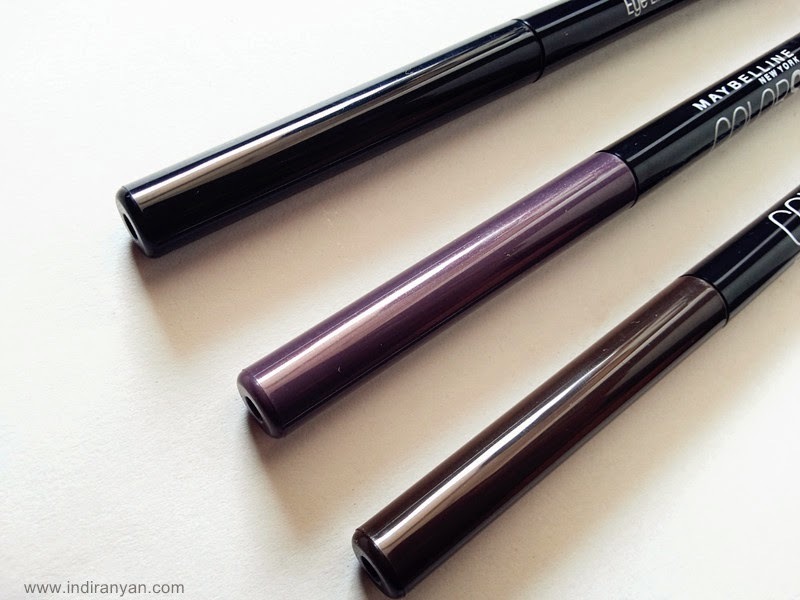 This eyeliner is not smudge on my oily eyelid, sweat-proof, waterproof, stay in long time. 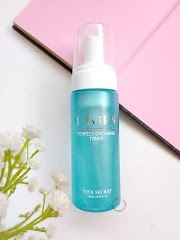 It doesn't need special remover to remove it, with oily-based or micellar water is okay. One bad point of this eyeliner is easily break, don't know if it is just me or maybe other people feel it too. 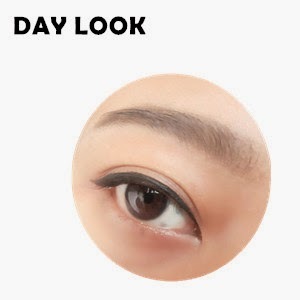 This eyeliner color is not really show up when applied on my eyelid so I need more energy when I apply but it ended up I break some milimeter or centimeter of this eyeliner. Despite one down point of this eyeliner, I still will repurchase this eyeliner since it doesn't smudge and stay on my eyelid for quite long. I also want too buy more color of this eyeliner, I think the Ocean Blue shade is a good color too. That's all my review now. 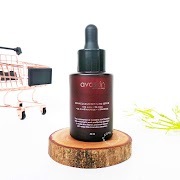 Hope it will help you to decide buy or not this product. Hmm, I never seen this Maybelline eyeliner whenever I shop, but I like the fact that it's very pigmented. I've been looking for a good drugstore eyeliner pencil for a while now, so I'll keep this one in mind. 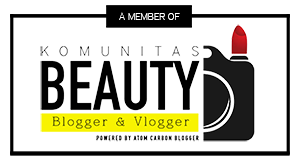 Nice review!! Wow it must not be that smooth if you broke some off... but the colours are really nice! I want to get the brown one for my eyebrows since it's waterproof!! Noble purple is so pretty!!! 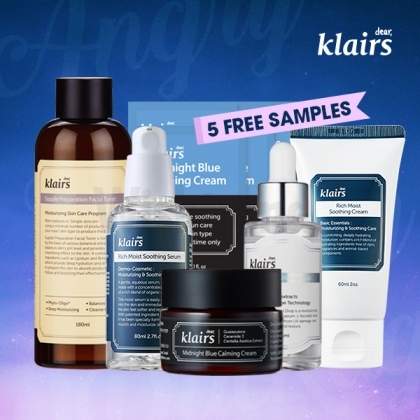 wah sayang banget yang noble purple ga terlalu keliatan ya klo di eyelid. padahal bajus banget klo di swatch di tangan. 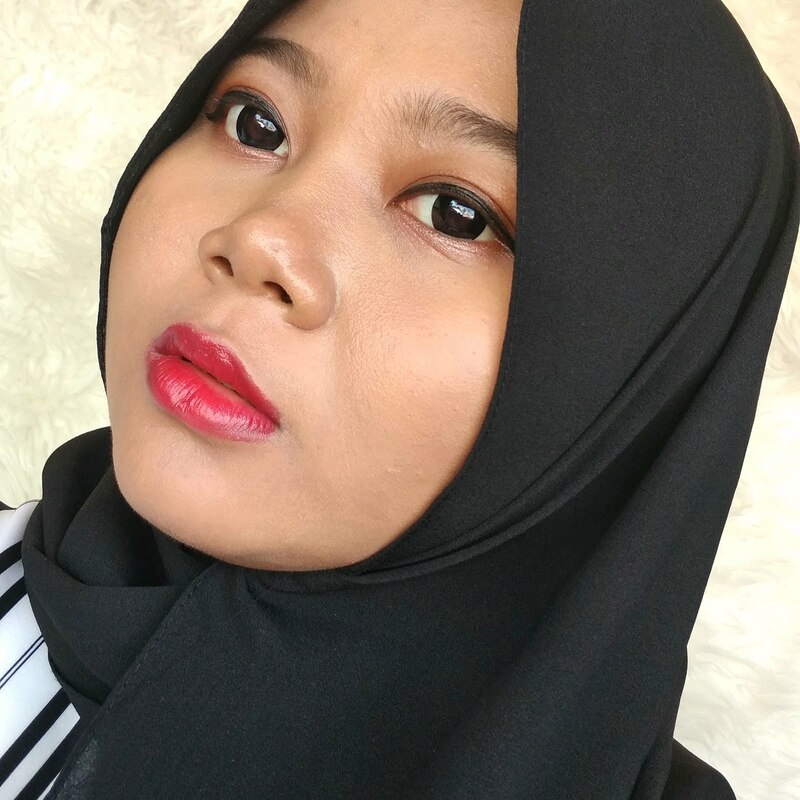 Udah sempet kepengen beli tapi jadi mundur selangkah deh klo tau ga bold warnanya di mata. suka sm yg warna unguuu :3 anw, salam kenal!